VietNamNet Bridge - Dr Le Viet Phu, a lecturer at Fulbright University, says the damages caused by air pollution to Vietnam in 2013 could be assessed up to $10 billion. The figure was calculated based on WTP approaching method, which considers the willingness to pay for reduction in air pollution. In 2013, the number of deaths because of PM 2.5 dust was 40,000, including 3,000 in HCMC. Human damage leads to economic damage because of the loss of income and the value of life, estimated at $250,000 per head (VND5 billion). With the high number of deaths because of air pollution, the economic damages would be 0.9-1.42 percent of GDP. Also according to Phu, scientists estimate with WTP method that each person dying of air pollution has the value of $1 million. This shows that in the countries which attach importance to environmental protection, the WTP index would be very high. Meanwhile, in the countries which attach more importance to economic development, the WTP index would be low. Therefore, Phu proposed to set up a strict legal framework on issues related to air quality control. He believes that Vietnam needs to set mandatory air quality level at 15-20 micrograms per cubic meter instead of 25 micrograms as currently applied. Ho Quoc Bang from the HCMC National University suggested that state agencies can refer to the monitored environment indexes to zone districts for emission. If some districts have pollution indexes exceeding the permitted levels, agencies will stop the development of factories in the localities and apply solutions to restrict travel in the areas. Meanwhile, factories need to be given ‘emission quotas’, i.e during one month or one quarter, they can only discharge into the environment certain amounts of waste. Bang said that it is necessary to apply measures to gradually reduce the number of vehicles using fossil fuel and encourage the use of public transport, biofuel-run vehicles and solar energy. Meanwhile, Hoang Thi Minh Hong from CHANGE, an organization for health and global environment, said the state needs a legal document on clean air with required air quality indexes meeting international standards. There is a big gap of 2.5-5 times between Vietnam’s current air quality standards and international standards set by WHO. 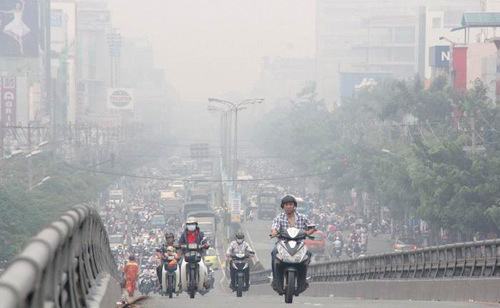 Hong believes that Vietnam needs to better control the air quality to come closer to global environment indexes. The 2016 EPI (environmental performance index) report released by Yale University showed that Vietnam was among 10 countries with the worst air quality, ranking 170th among 180 surveyed countries.